Family, both born into and acquired, has long been what drives leading country jockey Ben Looker and he’s lucky enough to have had three of them in his corner. The first is of course his parents Michael and Debbie, who embraced and encouraged a 12-year-old’s eagerness to work with horses. 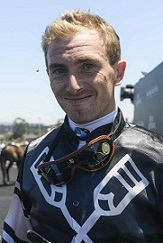 Jockey Ben Looker is enjoying a career best season. (Pic: Bradley Photos). Then there’s John and Kay Shelton, Looker’s first master and his wife, who taught him to ride and treated him like their own blood. And far from least is his partner of nine years, ex-jockey turned Sky Racing personality, Priscilla Schmidt who he’ll marry later this year. “I just always wanted to be a jockey, I don’t know why, I was always a well-balanced kid and natural at sports growing up so I felt like it came to me pretty easily,’’ he said. “When I was 12 my dad was friends with John Shelton and I started going in on the weekends and working for him. “He taught me how to ride in the back paddock. He has a couple of paddocks where the horses go out of an afternoon and it was big enough for me to practice. It didn’t take long for Looker to get on the board, winning on the Shelton-trained Unfair at Grafton in October 2006 at just his third ride. And as his profile rose as an apprentice it wouldn’t be a lot longer before he had to rely on both his parents, and the Sheltons, to keep his momentum going. “That first win was a day I won’t forget, all my family were there and no-one in my family has anything to do with horse racing whatsoever,’’ he said. “Mum’s a nurse and dad works at a saw mill. When I was 16 or 17 and going to Wyong and Gosford from Grafton I didn’t have a licence, so mum and dad would take it in turns taking days off work to drive me all over the countryside. That early success came at a cost. In 2008 he moved to Sydney for a three-month stint with Gai Waterhouse at Randwick with an overconfident attitude that would soon send him crashing back to earth. But, in no small part due to that family support, eventually Looker found his feet, moved to Brisbane to finish his apprenticeship with Dwayne Schmidt, Priscilla’s father, and soon after fell in love. “I was a ratbag kid when I was 17 and 18,’’ he said. Victorem (Ben Looker) salutes in the Country Championships Final. Photo: Steve Hart. “I probably rode a lot of winners in the bush too quickly and it gave me a bit of a big head. When I came to Sydney it was a real reality check. “You might be riding winners in the bush but it’s nothing. I let a lot of people down when I was younger being a bit of a rat and not caring about riding but in the past six or seven years I’ve got back all the connections I’d burnt bridges with. The pair bought a nine-acre property near Port Macquarie and have been based there now for over a year. They travel to race meetings together when Priscilla is working and are planning an American honeymoon over Christmas. Looker, now 27, is on pace for a personal best season with 77 winners to May 1 (87 as at June 4) as he closes in on his current mark of 97 set last year. 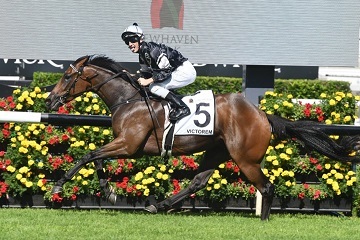 Then there’s his biggest moment in the saddle to date, on the biggest stage at Royal Randwick, when he won the $500,000 Country Championships Final on exciting three-year-old Victorem. And, as they were when he rode his first winner, fittingly his parents were trackside. “All my family were there, mum and dad drove down from Grafton at three in the morning. It was indescribable,’’ Looker said. “It felt very surreal. The next three or four days I kept thinking I’d wake up and it’d be Saturday morning again. 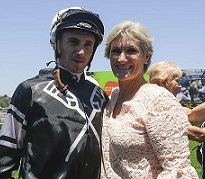 In the past couple of seasons Looker and Victorem’s trainer Jenny Graham have begun building a formidable combination. That support has been unwavering and is illustrated for all to see in Looker retaining the ride on Victorem for The Championships. “We have a really good relationship, she doesn’t give many instructions on her horses and we’ve had a great combination over the last couple of years,’’ he said. “All along Jenny and the owners said he’s your horse. Even when they went around first-up in the Highway I thought they might go with a Sydney jockey. Looker made his peace long ago with being ‘just a bush jockey’. It suits his personality. He doesn’t feel the need to be on top of the racing world but will happily follow a good horse, like Victorem, wherever it goes. And it suits where he is, and wants his future family to be, in life. “I love living in the bush. You have to do a lot of travelling to race meetings but I’m happy with that laid-back lifestyle and I enjoy where I’m at,’’ he said. Visit Racing NSW for all the fields, form and replays for racing across the state.